Alabama durable power of attorney is granting someone financial power of attorney is also important if you become injured or otherwise incapacitated and can no longer perform financial tasks. If no one has the right to conduct your financial matters, your family would have to go to court to obtain the authority to do so. To grant this authority, you can consult a lawyer to draft the agreement or find a premade power of attorney form and complete it yourself. Carefully consider candidates to act as your agent, because this person could do things like withdraw money from your accounts or sell your property. 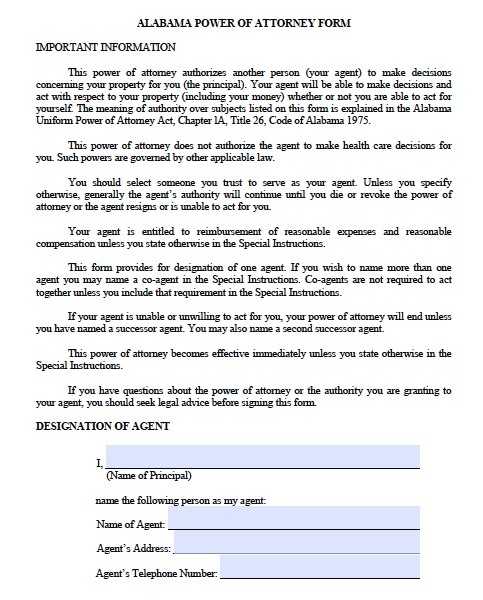 Power of attorney laws vary by state. In Alabama, the power of attorney is “durable,” meaning that it will not be affected by the principal’s incompetency, incapacity, or disability. If the principal does want the power to cease when he or she becomes incapacitated, the document must clearly state this. Alabama also does not require notarization for the document to be valid, but getting the document notarized creates a presumption that it is genuine. The document becomes effective when the principal signs it, and it will continue to be valid even after a long lapse in between uses of it.